We present here measured sensitivity and throughput of GRACES. Note that this was obtained after the GRACES fiber was installed permanently in the ESPaDOnS spectrograph at CFHT in preparation for the 2015B semester (GRACES Phase II), and represents current performance. Note that this performance shows a clear improvement compared to what was presented for GRACE phase I. We define sensitivity as the magnitude of an object that would provide a signal-to-noise ratio (S/N) of 1 for an hour of integration time. To calculate the signal-to-noise ratio, we measured the signal (S) from 60sec observations of the spectrophotometric standard star Feige 66. Those observations were obtained under pristine weather conditions, with a photometric sky and seeing close to 0.5 arcsec. The air mass at the time of the observation was 1.114, so the resulting spectrum was corrected to an air mass of 1.0 using extinction values (magnitude per air mass) from Béland (1988). The spectrum was also binned into the resolution element, i.e. 1.7 pix and 2.9 pix for the 1 fiber and the 2 fiber mode, respectively, so the final result is presented as a function of resolution element. GRACES can deliver a S/N of 1 in 1 hour for a target as faint as 22.4 mag in the 2 fiber mode (two-slice mode). Note that this result would be different if GRACES were used under poorer weather conditions. Sensitivity does not depend much on the seeing up to ~IQ85 due to the 1.2arcsec diameter of the fiber. However, the sensitivity would be less for non-photometric conditions, due to increased source extinction resulting in a value of 22.1 mag under CC70%, 21.4 mag under CC80% and brighter than 20.4 mag under CCany (see extinctions for the different cloud cover percentile here). In the 1 fiber mode (four-slice mode), GRACES can deliver a S/N of 1 in 1 hour for a target as faint as 21.4 mag. where μ is the air mass and Aλ is the extinction coefficient from Béland (1988). Our results show that 10-14% of the photons with wavelength between 600-800 nm that hit the Gemini North mirror get to the ESPaDOnS detector in the 2 fiber mode. In the 1 fiber mode, the same amount of light gets to the detector, but since the resolution element is smaller, we get values of 8-11%. One can see that all spectra are comparable. 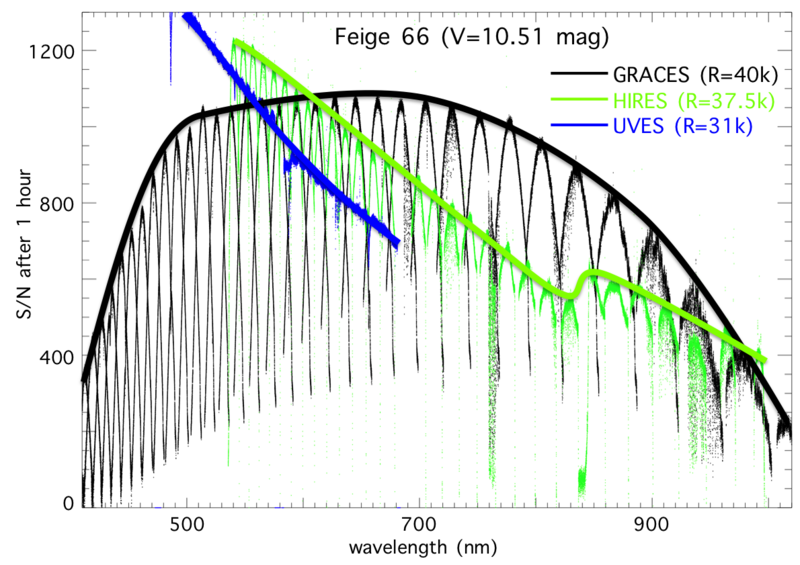 The HIRES and UVES spectra were modified to correspond to the GRACES resolution and the weather conditions when the GRACES spectrum was observed. More details about this comparison can be provided by the instrument team upon request. You may be interested also to read about the effect of Atmospheric Differential refraction (GMOS page).